This is a cigar that I had been sitting on for a while before review. It was hard to crack open the beautiful box, but today was the day. I bring you, La Palina’s Goldie Laguito No. 2. The Good Stuff: La Palina is the epitome of boutique cigars. Led by Bill Paley, the reformation of the blend surfaced in 2010 and has been a force ever since. Teaming up with some of the cream of the crop in terms of manufacturers, one of this year’s releases the “Goldie” is being produced by none other than El Titan de Bronze. You may be familiar with El Titan de Bronze as they have been responsible for bringing you lines such as the 13th floor, Bonita Smoke Shop 18th anniversary and Time Warp, Nestor Miranda – Casa Miranda, and many, many more. There was one very talented woman in charge of hand rolling each and every cigar in this line. Her name is Maria Sierra. 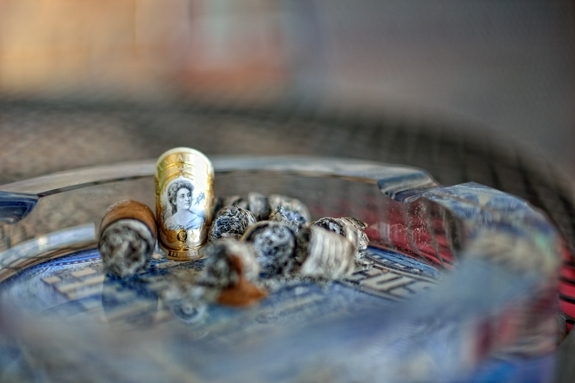 Maria is a master roller and one of the first women ever trained to rolled cigars in Cuba. She actually started her career rolling cigars for “El Laguito” where Cohibas were rolled some time ago. Maria was trained under the watchful eyes of Avalino Lara who actually created the Cuban Cohiba blend, as well as Eduardo Rivera Irazarri who was Fidel Castro’s personal cigar roller. 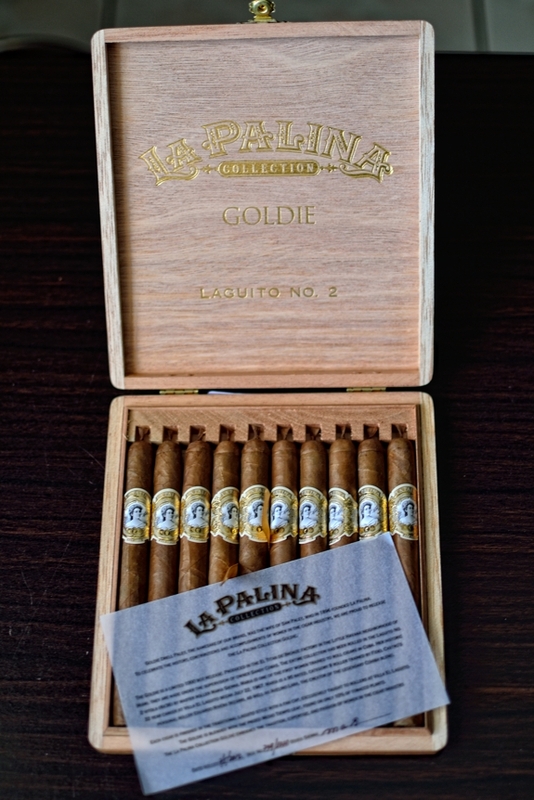 The Goldie is the second cigar in the “La Palina Collection”, after the 1896 Robusto. I only smoked one of the 1896 a year or so ago and loved it, but haven’t seen them since. The cigar only comes in one size, the “Laguito no. 2” or petit lancero as we know it in the States. The Goldie is also unique as it contains Medio Tiempo leaf, found only on 10% of tobacco plant. 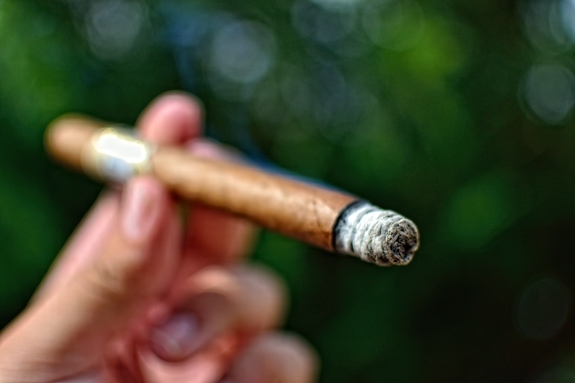 Not many cigars contain this leaf, but one that most people would recognize is the infamous Cohiba Behike. 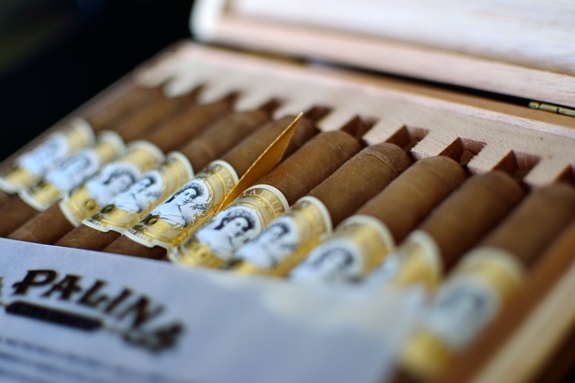 The Goldie comes in Cuban-style packaged boxes of 10. Only 1,000 boxes were released at $150 each ($15 per cigar), each with an imprinted number on the box as well as an inked signed certificate containing the cigar’s details, box number, and Maria’s signature. Mine was box 739/1000. I got this box over at Bonita Smoke Shop. If you are looking for the Goldie, she may still have a few, if not she always has a good amount of La Palina on hand, not to mention she has some of the best customer services out there. Prelight: The La Palina Goldie Laguito is a damn pretty cigar. In fact, everything that comes out of the El Titan de Bronze factory is spot-on in terms of construction. Needless to say, the Goldie has that extra special touch. The wrapper starts out with a very webby composure of small veins lying in it’s incredibly consistent light, yellowish brown wrapper. The wrapper seems a bit fragile but the Goldie gives very little as I compress it in my hands. 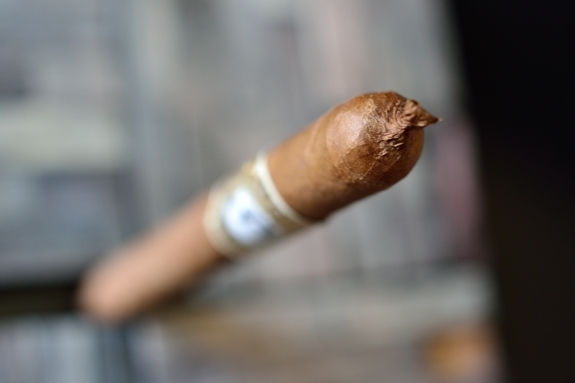 There are no soft spot throughout the entire body of the cigar all the way up to it’s pretty little triple cap with an added little tail to finish it off. The construction on these cigars are just perfect. The Goldie is polished off with the beautiful, standard gold, white, and black embossed La Palina logo. 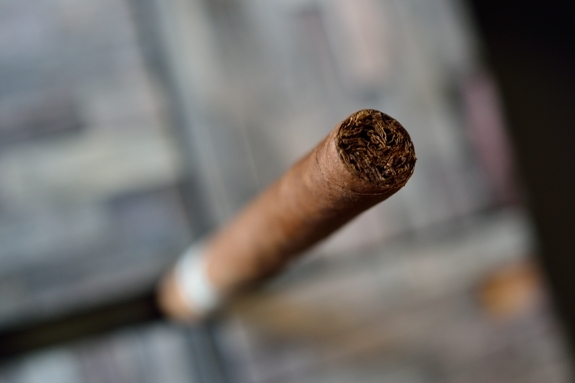 The wrapper of the cigar gives off a nice sweetness mixed with caramel and cinnamon. 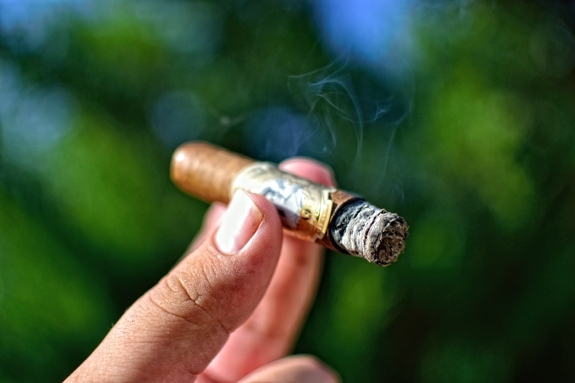 The foot of the cigar only gives off a small amount of cedar and vanilla scented tobacco aroma. The cap on the La Palina Goldie cut off very clean and easy using my Palio double bladed cutter. I was greeted with a very strong, milky, vanilla, sweet tobacco, and cinnamon cold draw. It reminds me of some sort of ice cream, or horchata. Either way, it’s tasty. 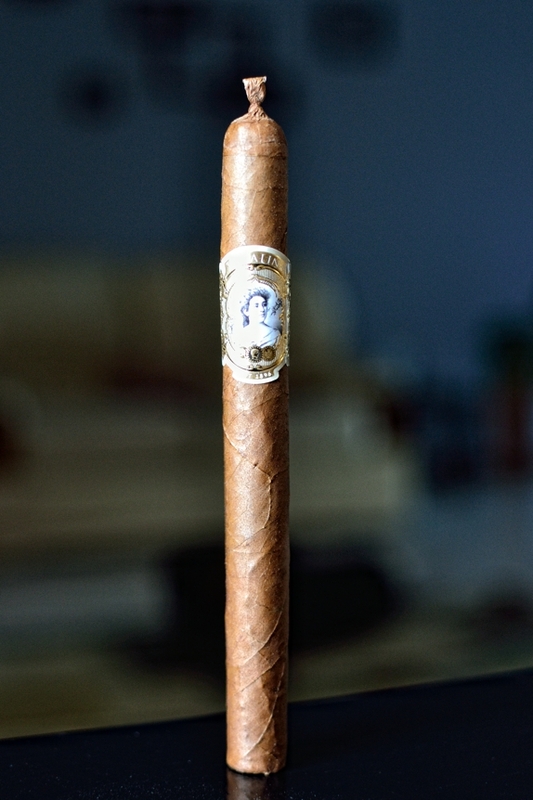 First Smoke: La Palina’s Goldie Laguito welcomed me with some nice, strong, unexpected black pepper. After the first few puffs the pepper began to fade and what I was left with was a crazy mixture of creamy milk, sweet tobacco, cinnamon, honey, and caramel. Yes, it tasted like a cigar made from a candy bar. The draw on this cigar was just fantastic. Really, this was one of the best constructed cigars I have ever smoked. Each tiny little draw pumped out a massive, massive cloud of thick white smoke. It was pretty windy outside when I was doing this review and even then the cloud hung around for quite some time before dissipating. Although the La Palina Goldie Laguito pumped out smoke in each draw, the cigar gave off almost no stationary smoke what so ever. The burnline is just perfectly even leaving behind a very thick, tightly compacted white ash that held on for almost an inch before giving way. Halfway There: Halfway through the La Palina Goldie Laguito and the flavors are still rocking. The cedar I picked up during the prelight has finally found it’s way through the honey, caramel, sweet, creamy flavors. I am also getting a really neat vanilla taste now too. These aren’t flavors I pick up too often but them blend in so well with this experience. The retrohale is just awesome as well leaving behind a soft cedar, honey, and almost banana flavor in my nasal passage. I am not feeling any nicotine at all as this cigar is still burning perfectly. Finish: Again, the flavors in the La Palina Goldie Laguito just don’t give up. The overall flavor profile is very creamy, but abundant. The vanilla, caramel, cinnamon, and sweetness is still there but the cedar and sweet tobacco flavors have really started to ramp up. It took me just a little over an hour to take down this petit lancer and I encountered absolutely no harshness, or heat build up the entire time. 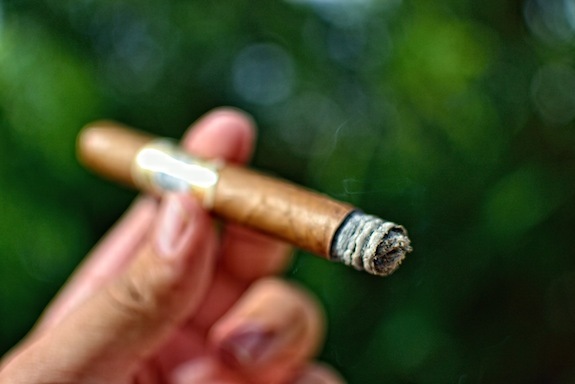 I smoked this cigar down until my chubby little fingers could hold on no longer. Overview: Needless to say, I loved this cigar. Let me just start off by applauding the work of El Titan de Bronze as they created probably one of the best constructed cigars I have ever had. That being said, take away the flavors and this one was of the best cigar experiences I have ever had. Now, when you add the flavors back in the mix it takes the Goldie to a whole new level. This thing is a flavor bomb with some very unique sweet, and strong flavors without ever getting too bold. The flavors just mixed with each other so well resulted in a perfect balance and complexity. This cigar is box worthy for sure, even with the higher price tag. I only have 2 gripes about this cigar. Number one, the availability. But that’s more selfishness on my part than anything. I just hope I don’t burn through these too quickly. And two, the smoking time. I tore through this cigar in about an hour, that’s taking my time too. Now I know what you’re thinking, “A $15 cigar that only lasts an hour?” even with that thought I can gladly say that it’s still worth the coin. I’ve liked so many of La Palina’s products and can honestly say, hands down, this is in my opinion the best cigar they have produced to date. 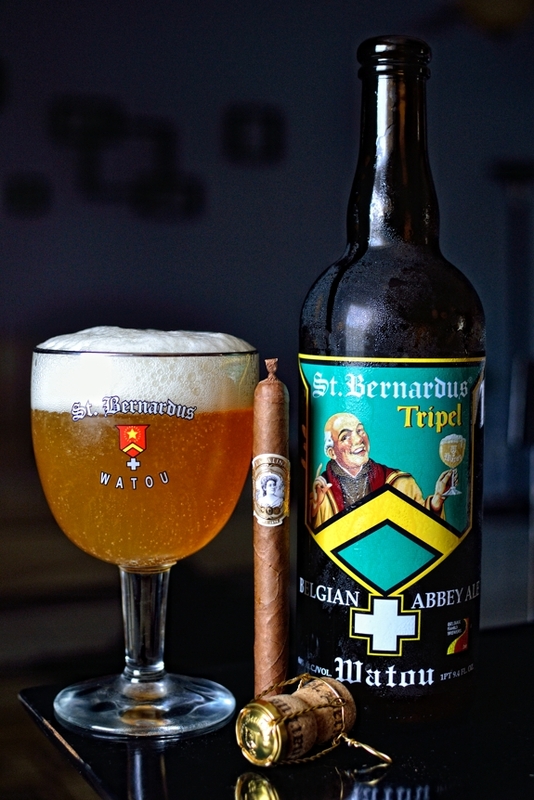 Pairing: As warmer weather is making it’s way to the southeast, I couldn’t let the summer pass me by without pairing another cigar with St. Bernardus’ Tripel. Again, this is the ultimate summer beer. Brewed at Brouwerij St. Bernardus in Belgium, this ale comes in at a whopping 8% ABV. Despite the higher ABV, you really don’t taste much of that alcohol in the beer itself. Instead, you are greeted to a nice banana, malt, sweet wheat, and sugar profile that fits right in with the hot weather. This beer may actually be the reason I picked up that banana flavor on my retrohale. The banana, sugar, and wheat meshed so well with the caramel, honey, and sweetness from the La Palina Goldie Laguito. It’s a match made in heaven. Sounds Great Tony glad you enjoyed them. The pictures look great this is on my radar now! thanks dude! Pick them up if you can. You’ll like them. Do it man, it’s worth it. Of course, the wedding comes first. Congrats on that. I loved my wedding and my wife even more. Best woman in the world! Man, what a great review, even though this seems to be a bit out of my price range. And you’re not the only reviewer to pick up on the banana flavor, so it probably wasn’t the beer that influenced your perception; maybe it just intensified it. Ha really?! I could have sworn it was the beer. I’ve noticed a lot of times that I pick up things in the pairings that are added by the beer alone. That’s why I try to smoke a few before deciding on a pairing. Thanks man! Love all your reviews Tony, been following you guys regularly for a year now and this is my first post, just ordered a box of these, can’t wait!! Awesome Gabe! Thanks for following. You sir, are a lucky man and I promise you won’t be disappointed. Great review Tony! This has been my favorite smoke so far for 2012. It’s unique in so many ways! I’m just glad I was able to score a second box to stash for down the road. These are amazing cigars!